Santorini is the top destination in Greece and among the most favorite holiday places in the world. Almost always it features in the lists with the top holiday and romantic destinations on Earth, attracting millions of visitors every summer. Its convenient location and good transportation can easily make Santorini a basis for island hopping in the Aegean Sea. Always dreamed to go for holidays in Santorini and you do not have the time or knowledge to take care of all the details? Here are some Greek island hopping packages from Santorini that we suggest. As Santorini has good ferry connections with many other Greek islands, it can easily be combined for holidays with destinations like Mykonos, Crete, Paros and Naxos. Split your holidays in 2 or 3 islands and get the best from your trip to Greece. Below is our list with Greek island hopping packages from Santorini or that include Santorini. They have been created based on the proximity with other islands and on easy ferry hops. Organize your holidays with us and you will not have to worry about anything. As we cooperate with many hotels and transfer companies, we always get the best offers for our clients. These packages are individual, not group, vacations. They include accommodation in lovely hotels, transportation and transfers from/to the ports/airports. Discover Santorini (Cyclades), one of the romantic destinations in the world, with our 3 Days/ 2 Nights individual Island Hopping package, starting from Athens. The beautiful sunset, the villages on the edge of the caldera and the active volcano create a perfect setting for your holidays. 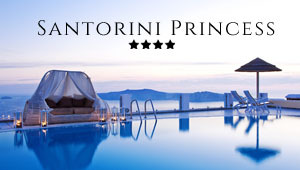 Discover Santorini (Cyclades) with our 5 Days/ 4 Nights individual Island Hopping package, starting from Athens. Visit the most historical sights of Athens and then hop to the most romantic destination in the world. Discover Mykonos and Santorini (Cyclades), the two most famous and picturesque Greek islands. Check our 7 Days/ 6 Nights individual Island Hopping package, starting from Athens. Visit the Greek islands of Paros and Santorini (Cyclades) with our 7 Days/ 6 Nights individual Island Hopping tour, starting from Athens. The vibrant atmosphere of Paros and the romantic sense of Santorini will offer you the best vacations. Discover our 7 Days/ 6 Nights individual Island Hopping package on the beautiful islands of Santorini and Naxos (Cyclades), starting from Athens. Both islands have something special to offer their visitors. Discover our 9 Days/ 8 Nights individual Island Hopping package on the splendid islands of Santorini (Cyclades) and Rhodes (Dodecanese), starting from Athens. Enjoy your holidays and let us worry about the organization details. Visit the most famous Cyclades islands with our 9 Days/ 8 Nights individual Island Hopping package, starting from Athens. Mykonos, Paros and Santorini create the perfect setting for incredible vacations. Discover our 9 Days/ 8 Nights individual Island Hopping package on the magnificent islands of Mykonos, Santorini and Naxos (Cyclades), starting from Athens. The most famous Greek islands in just one tour! Discover our 15 Days/ 14 Nights individual Island Hopping tour on the islands of Paros, Mykonos, Santorini and Naxos, starting from Athens. Starting from and finishing in Athens, this island hopping package will give you the chance to discover three islands with picturesque Cycladic style, relaxing ambiance and lovely beaches: Milos, Santorini and Paros. This island hopping package from Athens to the Cycladic islands of Santorini, Folegandros and Milos is especially created for romantic couples, looking for gorgeous settings and secluded atmosphere. Departing from Athens, this island hopping package gives you the chance to visit four of the most impressive and popular islands of Cyclades: Milos, Santorini, Mykonos and Paros. Explore the vivid life of Mykonos and the romantic atmosphere of Santorini, the two most popular islands of Greece. This is a perfect package for first-time visitors to Greece who want to get a great glance of Greek holidays. An island hopping to two amazing islands of Cyclades: discover the wild beauty of Santorini and the calm atmosphere of Naxos. These are two perfect islands with many differences in style and landscape. Discover the volcanic wildness of Santorini and the Medieval style of Rhodes in this economic island hopping package. These are two of the most famous islands of Greece. Discover the three most popular islands of Greece: Mykonos, Santorini and Paros amaze visitors with their traditional character and the unique beauty. These are three characteristic islands of Greece, a perfect package for first-time visitors. The intense life in Mykonos, the wild beauty of Santorini and the calm atmosphere of Naxos are waiting for you in this island hopping package, perfect for relaxation in the Cyclades. Discover the most famous and beautiful islands of Cyclades. An excellent island hopping package for first-time visitors and people who want to get a deep view of Greek holidays. Depart from Mykonos and explore the most beautiful islands of Greece. Visit Mykonos and Santorini, the top Greek destinations, and then continue to the less-developed islands of Folegandros and Milos.